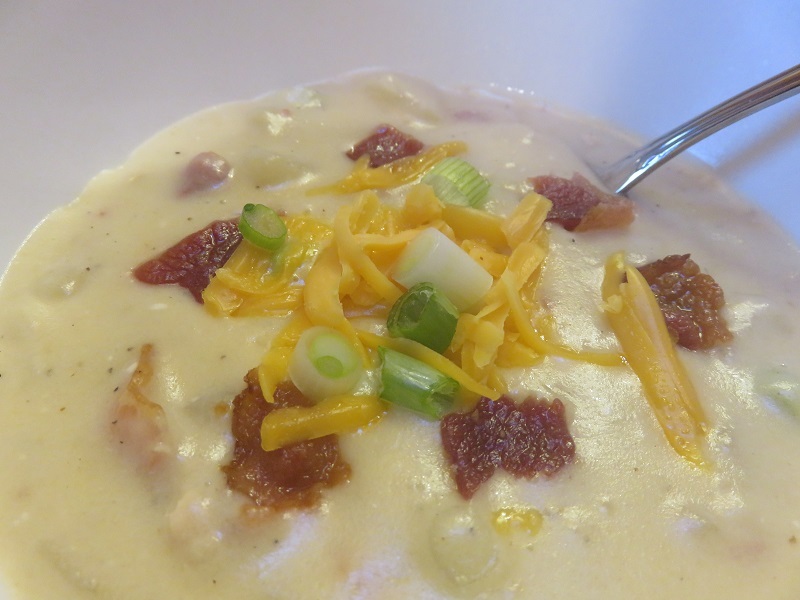 I have experimented for years with trying to duplicate the kinds of yummy loaded potato soup you find in many restaurants and eateries. Basically my efforts were something I made for myself; my family never “got” my attempts: they were not fans. Actually what I grew up on was a very simple farmer’s potato soup. Mom cut up leftover boiled potatoes, added milk, added maybe chopped celery and salt and pepper and we poured that over buttered bread cubes in the bottom of our bowls. We may have had grilled cheese sandwiches with that. A very simple soup and meal but to me it was tasty, warm and filling. We all liked it. Years ago, when I tried Mom’s soup on my daughters and husband once or twice, they were going “ehhhhh, what is this?” They politely ate some, if my memory serves, and then filled up on grilled cheese. I knew the soup itself wasn’t a go for this family. 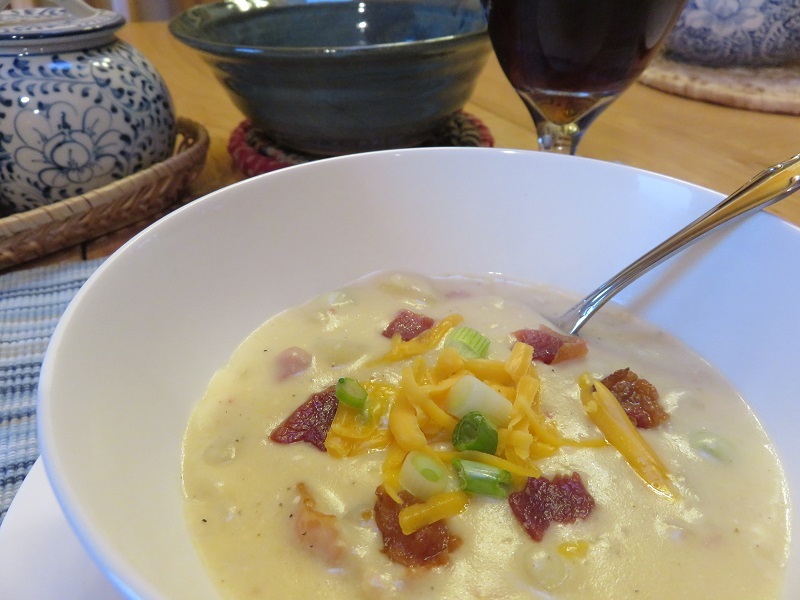 So over the years, I experimented with several recipes for a more loaded potato soup, for a Saturday lunch, just for myself. Eventually I doctored up a one-person serving recipe that I shared over on Amish Wisdom. Enter my friend Dianne who once owned a restaurant with her husband (now deceased). My husband and another Lion’s Club friend were doing some work at her home and for lunch she served them “Loaded Potato Soup.” My husband came home saying, “You’ve gotta get Dianne’s recipe.” I was shocked to hear he loved it! I went into action and tried it the first chance I got. It was the best loaded potato soup outside of a restaurant I have ever had. Just delightful! It took me about an hour to assemble it; it needs frequent stirring—to make sure it doesn’t scorch. But well worth the time and I’m sure next time I can shave that time. This makes a huge batch for 15-16, but I’ve also included the pared back quantity I made for me and my husband, with plenty of leftovers. Cook bacon over medium heat until crisp. Drain on paper towels. Reserve 2 tablespoons drippings in skillet. Cook onion in drippings until almost tender. Bacon–crumble up to use in soup. In 6-quart Dutch oven, mix onion, broth and potatoes. Heat to boiling, reduce heat. 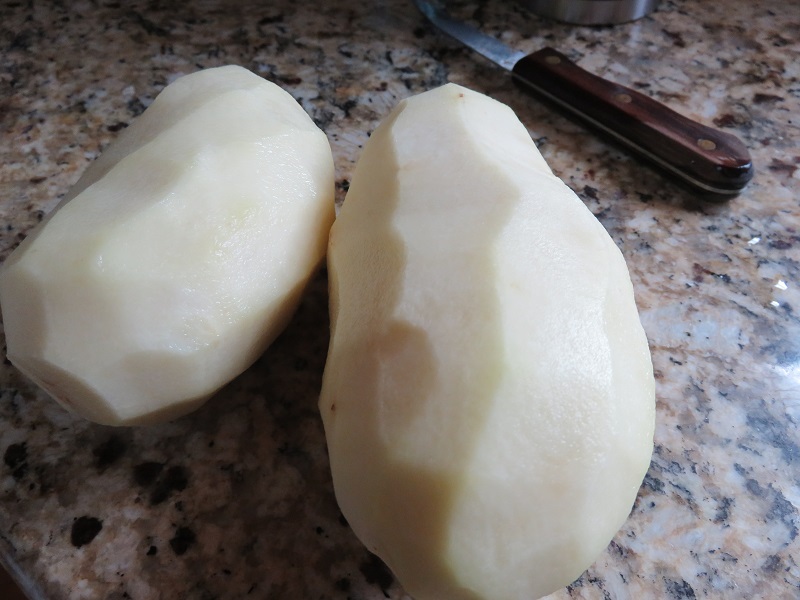 Cook 10 minutes or until potatoes are tender. Whisking butter and flour in skillet. flour. Stir with whisk until smooth. Cook and stir 1 minute. Gradually stir in 2 cups milk (will be very thick). 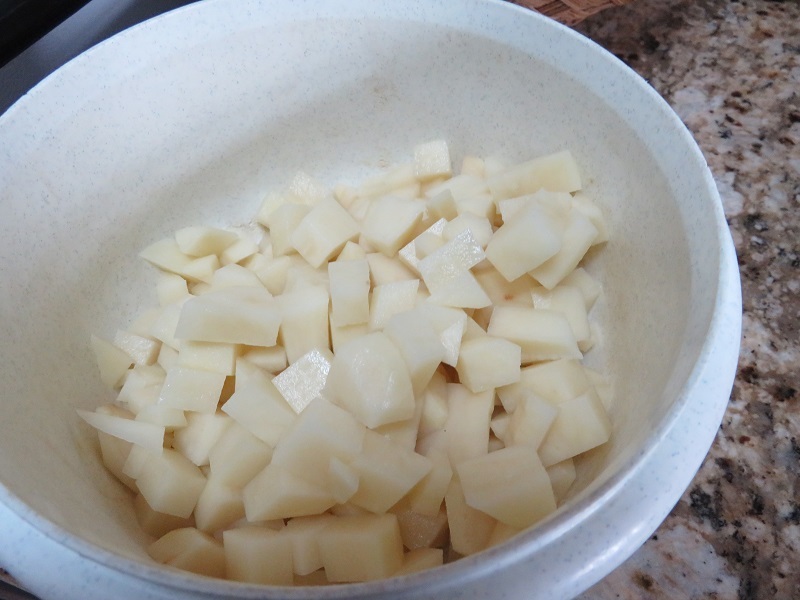 Pour milk mixture into potato mix. Add other 2 cups of milk, salt, and pepper. 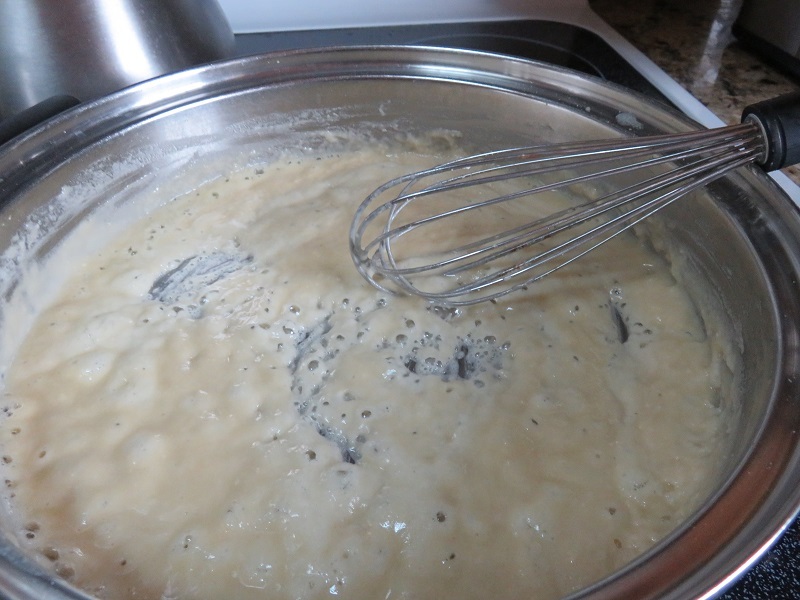 Cook over medium heat, stirring constantly with whisk, until thick and bubbly. 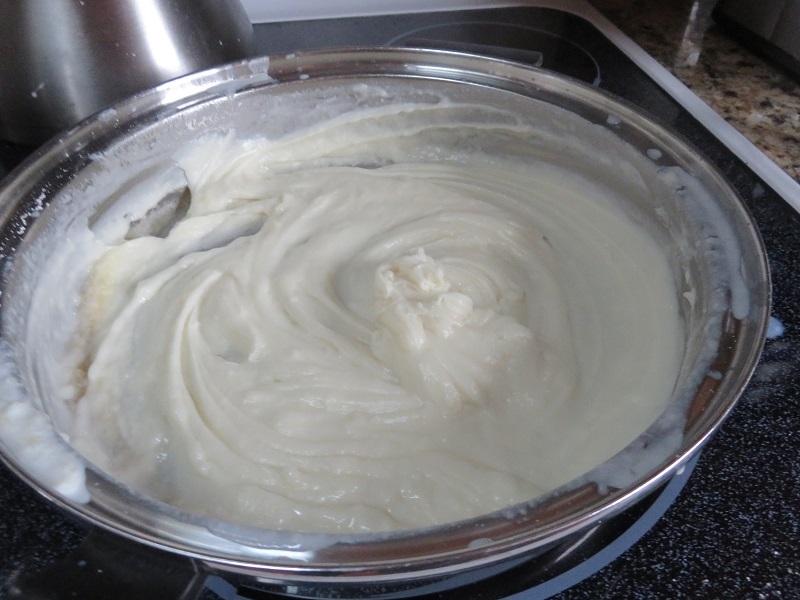 Mixture after you’ve added first 2 cups of milk to butter and flour mixture. Stir till smooth. Stir in ham, 1/2 of the bacon (crumbled), sour cream, 2 cups cheddar cheese, and ½ cup green onions. Cook til heated thru. Pour in serving bowl or individual bowls, and garnish with remaining bacon, ½ cup cheese and green onion. 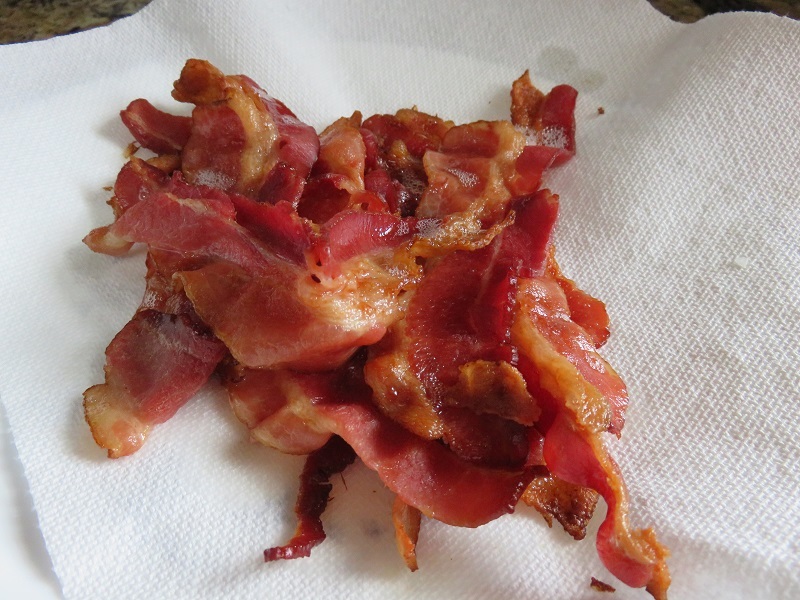 My bacon cooking tip: My standard method of cooking bacon is to spread bacon on parchment paper (learned this from a school cook) on a baking pan such as a cookie sheet with at least a half inch edge. Bake in 400 degree oven for 15-20 minutes. You don’t need to turn the bacon, just bake until your desired degree of doneness is reached. For this soup, I cooked the bacon in the oven, then drained bacon on paper towels. I then poured drippings from my cookie sheet into a skillet as recipe calls for, to cook the onions in bacon drippings. Then go from there using the skillet as describe in Dianne’s recipe. And P.S. The flour and butter mixing is basically making a roux. (Pronounced “roo.”) Adding milk or cream makes a bechamel sauce. Or gravy, if you prefer! I learned these schmancier terms when Dianne was rescuing a sausage gravy attempt for our Lions Club annual Pancake Days. Although spring has sprung, it’s still chilly where we live. What is your favorite soup, regardless of weather? Lovina Eicher has a loaded potato soup recipe in her most recent cookbook, The Essential Amish Cookbook, a volume I was privileged to edit. 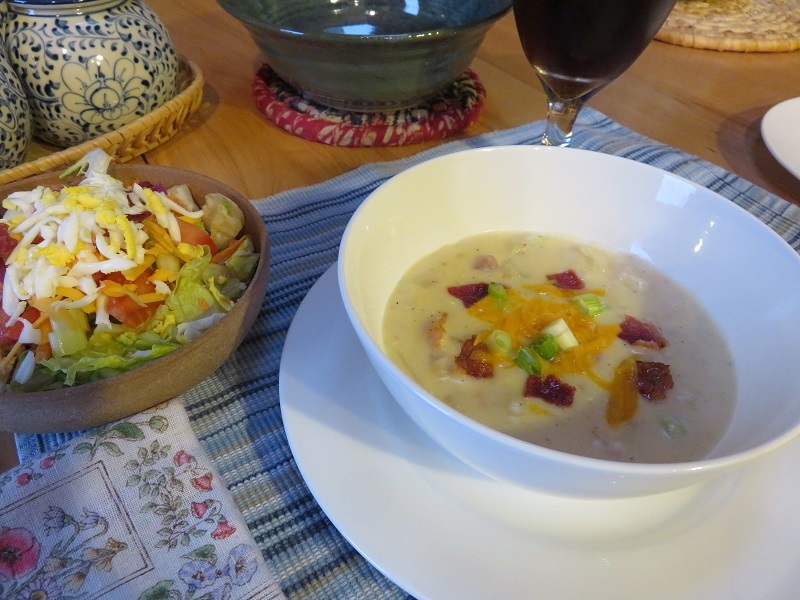 You can catch a video made of a model cooking her recipe for loaded potato soup here (along with where to buy the cookbook). My mother made a similar recipe, but she may have used cream – yum! Do you mean she made a similar loaded potato soup, or one more like my mother made. And I imagine cream was likely! Thanks for showing up here!